Women are sweeping today. I sweep too, and collect church dust, plaster dust, and one flower head. I sit on the edge, ledge, and bind my foot, begin to wind..
‘like swaddling, or death wraps’ someone says in passing, and I note the looping, and pulling…something to explore further..
and someone else flags up Mona Hatoum’s performance ‘Roadworks’, 1985. No such thing as a simple journey. Workman, chains, scaffolding, churning up the space and stillness. I sit and watch poles and planks come down, to reveal again the stone skin. I cannot hide today. I absorb myself in cutting. 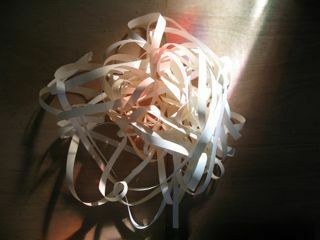 Long strips of paper, a ritual, like swimming lengths of a pool. Space opening up through the rhythm of the scissors. I attempt to re tune, from above to ground level. My breath plays with motion of cutting too. 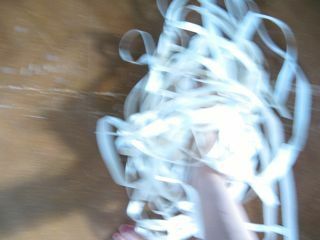 A gathering, and so I walk through piles of paper strips, searching. The sound is like walking through long dry grass..white fields.. 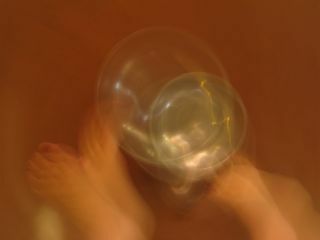 I record the sounds, it gives me another space, ambiguous shifting. I play back these fragments. I read this.